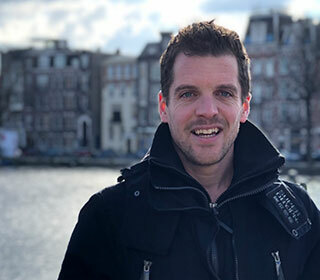 I am Bart, born in ’83, moved to Amsterdam in 2010 and currently work with student startups at the Amsterdam University of Applied Sciences. My main motivator is curiosity, and I love to read, listen to or watch stories about food, history, culture, politics, sport and cities. The thing that makes me the happiest is a big table full of food and sharing it with friends, family or colleagues. I experience Amsterdam as a city full of hidden gems — sometimes literally hidden between huge neon-signs or behind a small gate. Or it can be in a place where you don’t expect it to be and would never look for. Or there can be so much of something that you will not recognize the real thing. But in a city with less than a million inhabitants but more than 160 nationalities and countless cultures, these gems are never far away. And these gems, whether something seemingly basic or rare, are what make visiting or living in Amsterdam absolutely worthwhile.